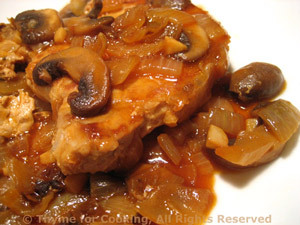 Braised Pork Chops, Mushroom Pan Sauce, Thyme for Cooking easy main course. Reduce heat to medium. Add chili powder and sauté briefly, about 30 seconds. Add stock and deglaze pan, stirring up any browned bits. Add vinegar, tomato paste and stir well. Uncover and simmer until sauce is slightly thickened. Serve.